All Bulb Crusher Models provide emission control to help create the safest work environment possible, while packaging spent bulbs or lamps! 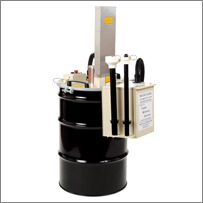 All Models utilize 55 Gallon Drum containers as a means of collection and all models include a system designed to filter both dust and mercury vapor. Incorporated into the the bulb (or lamp) crusher is a side-mounted dust filter unit containing the highest quality H.E.P.A. filter available. The H.E.P.A. filter works in conjunction with an activated carbon filter located in the steel canister. The activated carbon filter actively captures and neutralizes the mercury vapor released from the lamps during lamp crushing. Exceeds both OSHA and ACGIH standards for mercury vapor exposure. Crushes standard T12 fluorescent lamps. Removable adapters are available for T8 and T17 diameter lamps. Each 55-gallon container holds roughly 875 'T12 4', 1350 'T8 4', and 475 'T12 8' lamps. Heavy duty, 120v.a.c., UL/CSA approved motor crushes lamps in roughly one second or less. Even after crushing 1500 lamps, the most recent emission study showed non-detectable levels of mercury vapor emissions! Big Labor savings from crushing rather than boxing the Fluorescent bulbs / lamps. Eliminate storage hassles - Reduce your needed storage space for lamps by crushing over 1350 T8 4' lamps per 55-gallon drum (The Fluorescent Lamp Crusher / Compactor crushes all length lamps, see picture to better visualize size reduction). Reduce handling - Handle your spent bulbs once. Simply roll your Fluorescent Lamp or Bulb Crusher / Compactor system on a 55-gallon drum dolly (sold separately) to the work area or into a storage area. (Save roughly 20 hours of labor per 1000 lamps by crushing rather than boxing the lamps)! Safer work environment - EPA studies show an estimated 2-3% accidental breakage rate while boxing lamps prior to pick-up. The 0.001% emission rate from the Fluorescent Lamp Crusher / Compactor system provides for less mercury vapor emission. Your workers are not only safer, but your liability is reduced! A fluorescent lamp consists of a glass shell, a high vacuum, a small amount of liquid mercury and evaporated mercury, some phosphor powder, and the metal end caps and heated filaments. Fluorescent light is produced by passing an electric current through mercury vapor, which generates ultraviolet energy. A phosphor coating on the inside of the bulb transforms the ultraviolet energy into visible light. A single four-foot fluorescent tube contains from 5 to 50 milligrams of mercury. Each year, an estimated 600 million fluorescent lamps are disposed of in the US landfills amounting to 30,000 pounds of mercury waste. In 1992, mercury-containing lamps were added to the United States' Environmental Protection Agency's (EPA) list of hazardous substances. (The EPA's regulatory threshold of 0.2 mg./liter is usually exceeded by mercury-containing lamps). Due to the new Federal Environmental Protection Agency's regulations on lamps, which went into effect on January 6th, 2000, most non-residential facilities are now required by law to properly dispose of their lamps. Landfills are increasingly intolerant of lamps from non-residential sources due to the amount of mercury found in each lamp. Lamps later found in landfills are subject to retroactive clean-up costs under CERCLA. Recycling of the lamp components is the recommended method of disposal by the Environmental Protection Agency and helps to minimize facility liability. Proper packaging of the lamps coupled with the recycling of the lamps will greatly reduce the mercury dilemma and create a much safer environment. Listed below are some of the more common questions we are asked regarding the system. What is a Fluorescent Lamp Crusher / Compactor? A Fluorescent Lamp Crusher / Compactor is a lamp crushing machine that processes, or crushes, spent fluorescent lamps into small fragments. The crushed glass is compacted into 55-gallon containers. Over 1350 T8 4' lamps can be crushed into one 55-gallon drum. Both straight fluorescent lamps and u-shaped fluorescent lamps can be crushed. This greatly improves storage of the lamps, handling, safety/liability issues, and recycling costs. The units are complete with filtration systems to help ensure both OSHA and EPA compliance, even for facilities disposing of large quantities of lamps. Why do people use the Fluorescent Lamp Crusher / Compactor system? Facilities across the world use the Fluorescent Lamp Crusher / Compactor to make their lamp disposal process more efficient. The systems will greatly reduce storage needs, minimize handling of the lamps, create a safer, cleaner work environment, and cut overall recycling costs. How does the Fluorescent Lamp or Bulb Crusher / Compactor work? The Fluorescent Lamp or Bulb Crusher / Compactor’s filtration system pulls the contaminated air out of the drum to filter out the released powder as well the mercury vapor. The carbon filter not only captures the mercury vapor, but also neutralizes it by converting the vapor to mercuric sulfide, which is non-hazardous. Clean air comes out of the Fluorescent Lamp Crusher / Compactor exhaust vent. What is the difference between the different Models? Basically there are 4 Models (Model 1300, 1400; 1501 & 1502) The first 2 Models do not handle CFL's. Model 1300 Handles only Straight Bulbs and Model 1400 handles both stright and U-Shaped. Model 1501 & 1502 handle CFL's and Straight Bulbs but not U-Shaped. Model 1501 is 120v and Model 1502 IS 220V. All models are emissions controlled systems that are able to crush straight fluorescent lamps of any length and diameter. Each of the units has removable entry tubes that can be supplemented with the other entry tubes that are available. The entry chute for the u-shaped fluorescent lamps can be removed and sealed while crushing straight lamps. The diameter of a lamp is measured in eighths of an inch and expressed as a "T" number, such as T8 (equals 8/8's or one inch) and T12 (equals 12/8's or an inch and a half diameter). T17 lamps, while uncommon, are 17/8's or 2 and an eighth inches in diameter. This designation is given in lamp catalogs and sometimes printed on the lamp itself. For example, one of the most common 4' lamps is an F40T12/CW. The Fluorescent Lamp Crusher / Compactor systems come standard with an entry tube fitted for T12 lamps. T8 and T17 entry tubes are also available. Yes. In fact, studies show that it is actually safer to package lamps by using Fluorescent Lamp Crusher systems than boxing the lamps intact. This is because the Fluorescent Lamp Crusher / Compactors capture over 99.99% of the mercury vapor released during crushing. While there is a small amount of mercury vapor released, the overall mercury exposure is significantly less than when managing the same quantity of lamps intact and dealing with the accidental breakage of the lamps. No one intends to break the lamps while handling them, but unfortunately when handling tubes of glass up to 8' long accidental breakage is unavoidable. Based on EPA studies that show an accidental breakage rate of 3% (which based on our industry knowledge we believe to be low), our customers are considerably safer crushing their lamps with our controlled emissions systems. Due to the potential for mercury vapor exposure, our emissions-controlled lamp crushing machines have been tested for OSHA safety compliance by outside testing laboratories (test results available). These tests show that the operator experiences well under both Federal and State OSHA mercury vapor exposure levels. In fact, our most recent emission study showed non-detectable levels of mercury vapor emissions even after crushing 1500 lamps! Contact us to have the drums picked up and transported to one of the contracted recycling facilities to be recycled. This is the preferred method of the Environmental Protection Agency and is the most cost efficient option. Depending on your state regulations, you may be able to exclude this waste from your hazardous waste totals. Contact us for a customized recycling quote. Filters can be purchased directly from WasteCare Corporation. The Fluorescent Lamp or Bulb Crusher / Compactor is warranted for one (1) year from the date of original purchase against defects in workmanship and/or materials under normal usage. This warranty does not cover damage resulting from negligent handling, misuse or lack of reasonable care. Parts that prove to be defective during the one (1) year warranty period will be either repaired or replaced. The right is also reserved to replace the product in lieu thereof. The full remedy for breach of the warranty and the sole obligation is the repair or replacement of the defective Fluorescent Lamp Crusher / Compactor. No liability whatsoever at any time shall be extended for any personal injury or property damages or for any special, indirect, or consequential damages of any kind. This warranty is strictly limited to its terms and is in lieu of any and all other understandings, warranties and conditions, written or oral, whether expressed or implied. Listed below are some of the more common regulatory questions. Facilities that throw their spent lamps in the trash thinking they are saving money may be mistaken. Throwing spent lamps in the trash may result in the person being held responsible for the cleanup of a remote and costly Superfund site. Because of the potential liability under Superfund, facilities that decide to recycle their spent lamps are making a smart decision that benefits not only the environment but also the bottom line. Universal wastes are specific hazardous waste streams that facilities can choose to manage in an alternative manner in place of the more complex hazardous waste requirements. These wastes are typically generated by many facilities and are often not properly managed under hazardous waste regulations. Conditionally Exempt Small Quantity Generators (CESQG's) are persons who generate 220 lbs. or less of all hazardous wastes combined (not just lamps!). These generators are exempt from most of the hazardous waste regulations, which include transportation, treatment, and disposal requirements. They must not, however, store more than 2200 lbs. of hazardous waste on site at any time and must dispose of their hazardous waste in facilities that are permitted or authorized to accept hazardous or non-hazardous wastes. Many states acknowledge CESQG exemptions for paperwork, but not for disposal. Many states do not allow CESQG to dispose of hazardous waste in a solid waste landfill. Small Quantity Generators (SQG) are persons who generate 220 to 2200 lbs. of hazardous waste per month. These generators must keep proper records of the waste, report to EPA, and follow accumulation requirements. These generators can store up to 6 months without a storage permit. Large Quantity Generators (LQG) generate more than 2200 lbs. of hazardous waste per month. These generators are subject to the full hazardous waste management requirements. These generators cannot store hazardous wastes on site for more than 90 days (3 months) without obtaining a storage permit. Small Quantity Handler - Generator who accumulates less than 11,000 lbs. of universal waste (batteries, pesticides, thermostats, or lamps) at any time. Large Quantity Handler - Generator who accumulates more than 11,000 lbs. of universal waste (batteries, pesticides, thermostats, or lamps) at any time. Controlled crushing of lamps is regulated under both federal and state hazardous and universal waste regulations. The federal universal waste regulations do not authorize on-site crushing of fluorescent lamps but do allow the States to write rules that will permit crushing on-site. Most states allow the crushing of lamps on-site under the universal waste regulations. (Some states like Ohio do not have a universal waste category but do have a "Characteristic By-Products" classification. This classification is very similar to a universal waste classification.) There are still a few states that prohibit the Bulb Crushers which currently include California, Vermont, Minnesota, Missouri, Maine, Connecticut, Pennsylvania, New Hampshire, Rhode Island and West Virginia. New Jersey allows them provided the facility obtains a permit. In States that allow crushing and classify crushed lamps as universal wastes, persons can generally store their waste lamps on-site for up to one year, can ship waste lamps off-site with a bill of lading rather than a hazardous waste manifest, and need not include their lamps when calculating their hazardous waste totals. Under state and federal hazardous waste regulations, controlled crushing (which is what the Fluorescent Lamp or Bulb Crusher / Compactor systems do) is considered treatment. The hazardous waste rules typically require a person who treats wastes to obtain a permit. Federal and most state hazardous waste rules, however, exempt from the permit requirement persons who treat their wastes "within a drum, tank, or container." (See 40 CFR 262.34). We believe the Fluorescent Lamp Crusher / Compactor systems fall squarely within this exemption and many States have acknowledged in letters that the accumulation tank exemption applies to the Fluorescent Lamp Crusher / Compactor systems. If your State does not allow crushing under its universal waste regulations, then you typically may manage crushing under your state's hazardous waste regulations as a process exempt from the general permitting requirements. Please note that regardless of whether the lamps are managed as universal or hazardous wastes, you must properly dispose of the crushed lamps preferably by shipping the crushed lamps to a permitted recycling facility. Customers are always welcome to contact us for further information concerning federal and state regulations. We have access to a database of contact names at both federal and state environmental protection agencies, as well as guidance papers from many states that are available to our customers. We are more than willing to help you learn more about applicable regulations. Email us at Info@WasteCare.com or RecycleLamps@WasteCare.com for more information. Lamp recycling services and transportation is offered throughout all of the United States in order to assist facilities in properly recycling their lamps. Once the lamps are picked up, they are transported to a permitted facility for lamp recycling. Systems separate the lamps into lime soda glass, aluminum end caps, lead glass/ferro metal components and phosphor powder. The phosphor powder is then retorted to capture the mercury. All of these lamp components can be reused. The operating conditions meet even the toughest environmental standards. The entire process is fully automatic and incorporated in a container in which the air is brought to subpressure, thereby preventing mercury from being released into the environment. Exhaust air is constantly discharged through the internal carbon filters. With the aid of a sophisticated patented air transportation system, the phosphor powder is separated in different steps from the by-products. The mercury bearing powder is collected in distiller barrels beneath the cyclone and the self-cleansing dust filters. This mercury bearing powder will later be retorted to drive the mercury out of the powder.